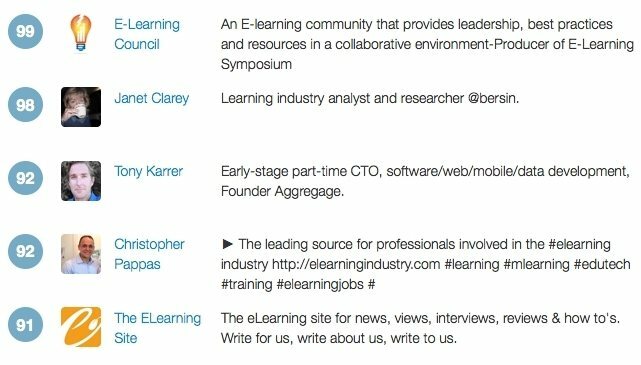 Are you involved in the eLearning field? Do you use Twitter? At the following list you will find the Top 20 of the most influential eLearning Professionals on Twitter. Janet Clarey (98)Learning industry analyst and researcher @bersin. Tony Karrer (92)Early-stage part-time CTO, software/web/mobile/data development, Founder Aggregage. The eLearning site for news, views, interviews, reviews & how to's. Write for us, write about us, write to us. Cammy Bean (88)Wise-crackin' learning designer with Kineo; making better eLearning throughout the world. Informally pursuing an ID degree. And I mean that most informally. David Hopkins (87)eLearning, mLearning, Web 2.0, Blogging, WordPress, Blackboard, Tech, CMALT, QR Codes, Social Media, eBooks - Learning Technologist. All views are my own! RJ Jacquez (84)#mLearning / #eLearning Analyst and Consultant. Blogging and Podcasting the Mobile Learning Revolution. Former Adobe Senior Evangelist. Hablo Español. HP Teacher Exchange (78) Educational technology leader committed to 21st Century learners and their teachers. Technology trainer. Community manager for the Teacher Experience Exchange. Building Smarter Companies Through Community and Collaboration Managed by @JDiDonato & @Schapman_speaks Attend #ELCE12! Tracy Parish (77)Trying to learn at least one new thing each day. (elearning, ID, education technology, social media and learning). eLearning consultant, modernist, film buff, occasional provocateur. Source: wefollow.com eLearning what else?